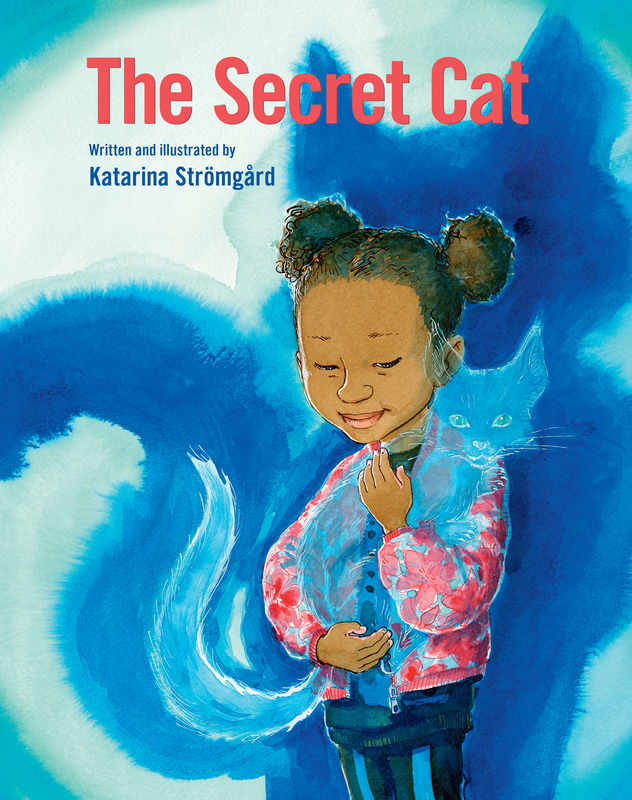 The author bio for this Swedish import, originally published in 2017 as En hemlig katt, notes that Katarina Strömgård’s favorite books “often inhabit the space between reality and fantasy,” which is an apt description for this picture book beauty. The Secret Cat (Eerdmans) will be on shelves here in the U.S. in early February. This is the story told from the point of view of a girl who isn’t allowed to have a pet — but longs to. Her mother gives the girl “all sorts of reasons” why they can’t have one and points out they have an aquarium full of fish. The girl’s having none of that, thanks very much. “Real pets have fur!” But one night, as you can see in the spread above, the girl hears scratching behind her bedroom wall and eventually a cat “claws open a narrow hole and slinks out.” (I love this moment.) It’s the girl’s very own cat — but a secret one. “She rubs against me like a shadow.” The girl is eager for the creature to be her pet. (In true cat fashion, it responds with a “we’ll see.”) She names the cat Silvring. The fantasy elements in this narrative expand as the story continues. The cat, composed of silvery shadows, shifts in size; when the girl and her cat take a nighttime stroll, they see the secret pets of other humans, some fantastical in nature (one man walks by with fish, hovering in the air, on a leash); and we even meet a dangerous secret pet (not all of them are nice, says the secret cat). “‘Silvring, do you think everyone has a secret pet?’ I ask. Silvring doesn’t answer. “The Danger grows larger and larger and stretches toward us. Silvring hisses. As you can see, however, Silvring has things under control. These are illustrations to pore over, particularly the shapes and hints and secrets Strömgård paints in the shadows of both night and day. The silvery blue you see in many of the spreads here dominate the book’s palette but are balanced by warm rose and yellow hues. Strömgård paints with a sure and lyrical line, and her nighttime vistas are beguiling. 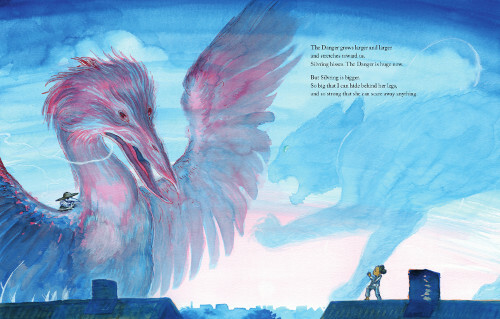 The girl’s yearning for a pet — even her inability to have one — is something to which child readers the world over can relate. And the notion of a secret pet — “They sleep and wait for night to come,” living behind the wallpaper as they do — will be an irresistible one to many readers. THE SECRET CAT. 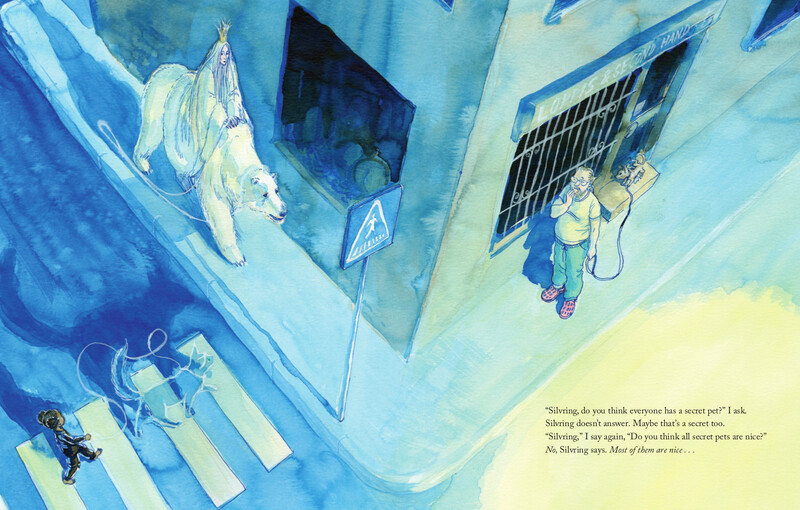 Text and illustrations © Katarina Strömgård and Hippo Bokförlag, Stockholm 2017. 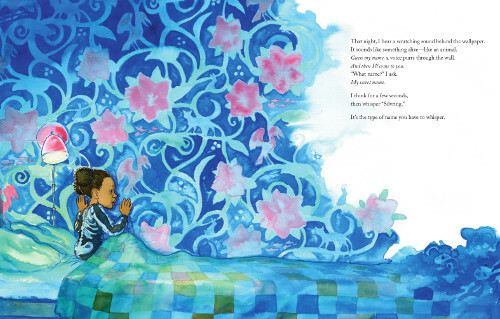 English-language edition © 2019 Eerdmans Books for Young Readers. Originally published in Sweden in 2017. Illustrations reproduced by permission of the publisher, Eerdmans Books for Young Readers, Grand Rapids, Michigan.